Last week the 2018 Consumer Electronics Show (CES) wrapped up in Las Vegas and left us feeling excited and invigorated about what’s to come in tech. From talking toilets to snuggle robots, CES 2018 was yet another reminder of how deeply technology has infiltrated every aspect of our lives. This year, once the world’s largest tech show found its way out of the dark, CES was all about virtual assistants. Amazon’s Alexa has dominated the virtual assistant category—claiming 70% of the market share in 2017 and then ending the year with strong holiday sales as the most downloaded app for Apple and Android on Christmas Day. But this year, Google (who typically keeps a low profile at CES), made its presence loud and clear. From wrapping the Las Vegas monorail with the words “Hey Google” to erecting a massive playground in the CES conference center parking lot (complete with a giant gumball machine), Google is making it clear that it intends for Google Assistant to be a legitimate contender in the virtual assistant space. Both Google and Amazon used CES 2018 as a platform to announce new partnerships for their virtual assistants. Alexa will soon be found in Toyota cars, Vuzix smart glasses, and Kohler smart toilets. Meanwhile, Google is integrating its smart technology with a slew of products from leading brands like Sony, Lenovo, and Huawei. If there’s one takeaway from these partnership announcements, it’s that voice assistant technology will not be confined to the realm of their makers’ product lines. Instead, voice assistants intend to be everywhere—plugging into smart glasses, smart earbuds, and smart toilets—underscoring the tech industry’s expectation that voice assistants will continue to play a much bigger role in our digital lives. It appears Google’s goal at CES wasn’t necessarily to woo tech lovers with its Google Assistant. Rather, it was to show regular people what is possible with virtual assistant technology. 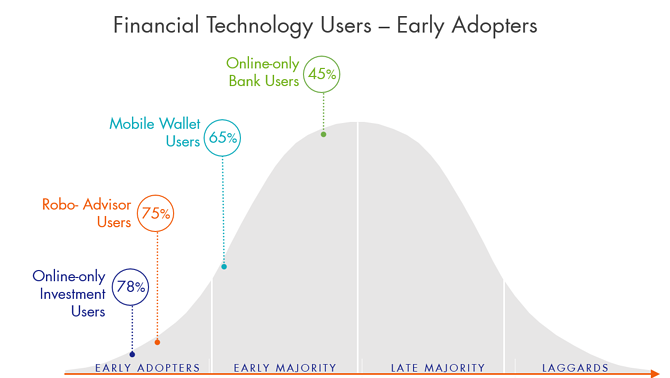 This is important because it demonstrates the (potential) ubiquity of this category once thought of as only for early tech adopters. However, despite pushes to show “regular" people that virtual assistants are meant for everyone, our research indicates that social identity is playing a role in preventing widespread virtual assistant adoption. However, currently, consumers can’t relate to the typical virtual assistant user, which is keeping them from “crossing the chasm” and becoming regular users themselves. The virtual assistant category will only grow in complexity as more companies enter the game (let’s not forget about Siri and Cortana). But, while flashy conference displays, exciting partnership announcements, and product demos are all helpful in attracting more consumers, if virtual assistant brands want to achieve more mainstream adoption, the brand and creative teams need to tackle the virtual assistant image problem head on. Savannah House is the Marketing Manager at CMB, and as a light sleeper, is most excited about the robotic pillow. 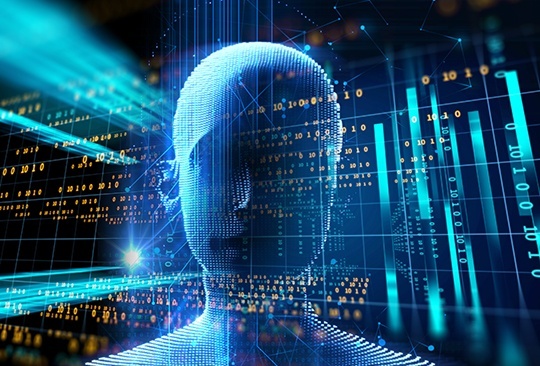 AI's Image Problem: Who's the "Typical" Virtual Assistant User? Word of mouth can play a huge role in motivating certain segments to sip the Kool-Aid and make the leap. I hypothesized that the virtual assistant (VA) category—and specific brands within it—faces this challenge. Yes, many people have tried and used Siri, but few mainstream consumers are truly using virtual assistants for anything beyond basic hands-free web-queries. To further complicate things, an increasing number of “smart home” products that connect to intelligent wireless speakers in the home (e.g., Amazon Alexa, Google Home, Apple’s forthcoming HomePod) are proving divisive. Some people love the experience or the idea of commanding a smart device while others categorically reject the concept. My team and I had the chance to test out a few hypothesis through our Consumer Pulse program and —voila!—we’ve got some tasty (and useful) morsels to share with you about how social identity is influencing consumer adoption in the virtual assistant space using our proprietary AffinIDSM solution. Social identity matters in the virtual assistant space. We studied US consumers (18+)—covering usage, adoption, and perceptions of the virtual assistant category and a deep-dive on four major brands within it: Apple’s Siri, Amazon Alexa, Google Assistant, and Cortana by Microsoft. 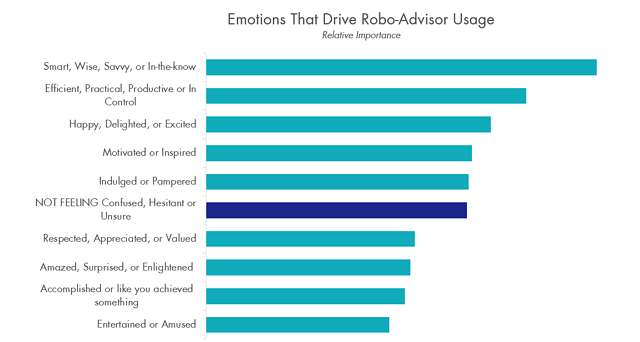 We covered rational perceptions of the category, emotional reactions to experiences using virtual assistants, and perceptions of the “typical” user of Siri, Alexa, Google Assistant, and Cortana. Unfortunately for the industry, category rejecters do not find the typical VA user very relatable. As the chart indicates, relatability (biggest predictor of likelihood to try as shown previously) scores the lowest of the three components of AffinID: relatability, clarity, and desirability. You may ask yourself: “are scores of 12 to 14 ‘good’ or ‘bad’? They’re bad: trust me. We’ve now run AffinID on hundreds of brands across dozens of industries, so we have a formidable normative database against which to compare brands. 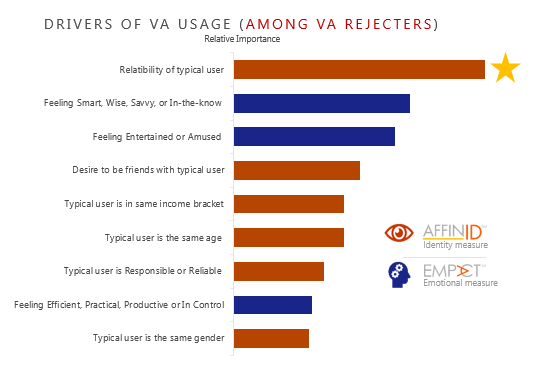 The VA category does not fare well on “relatability,” and it matters. Some brands’ VA ads, while amusing, are not very relatable to “normal” mainstream consumers. For example as my colleague Erica Carranza points out in her recent blog, Siri’s ad featuring Dwayne “The Rock” Johnson doing impossibly awesome things in one day (including taking a selfie from outer-space) with the help of Siri isn’t exactly a “normal” person’s day. A-grade for amusement on this one, but it is playing into an existing perception problem. Stereotypes about users’ age and income are currently keeping “rejecters” away from the virtual assistant category. The age gap between rejecters and “typical” virtual assistant users is a social identity construct keeping rejecters out of the category. Current rejecters, not surprisingly, skew older while current heavy VA users, also not surprisingly, skew young. 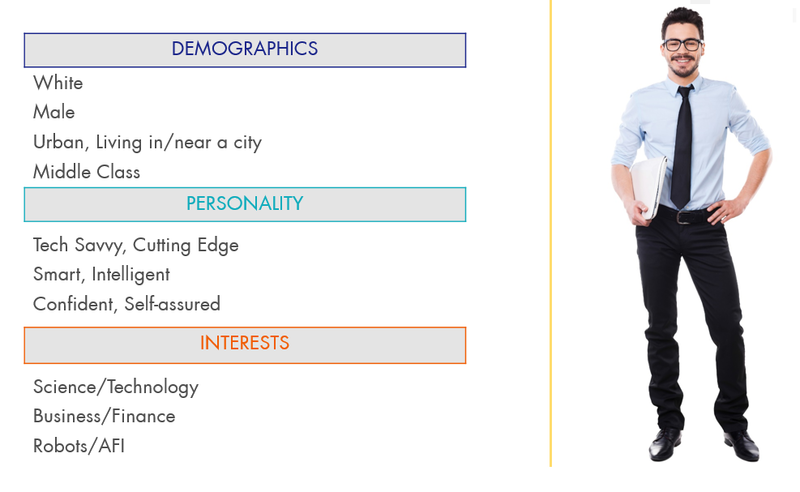 We uncovered this disconnect with a big predictive model using “match analysis” on a variety of demographic, personality, and interest attributes. 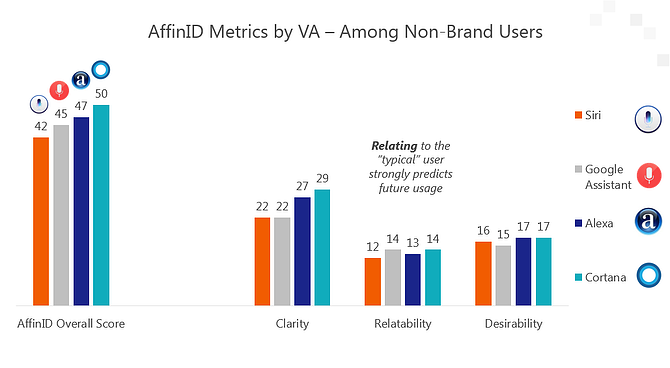 For every attribute, we examined whether there was a “match” or a “disconnect” between how a rejecter described themselves vs. how they perceived the typical user of a virtual assistant brand. The two specific perceptions that had the greatest ability to predict a rejecter’s likelihood to consider using a brand in the future was an age-range match and an income-range match. For example, if I’m over 35 years old (hypothetically! ), and I perceive the “typical” user to be under 35 years old and higher-income than me…so what? Well, it does matter. 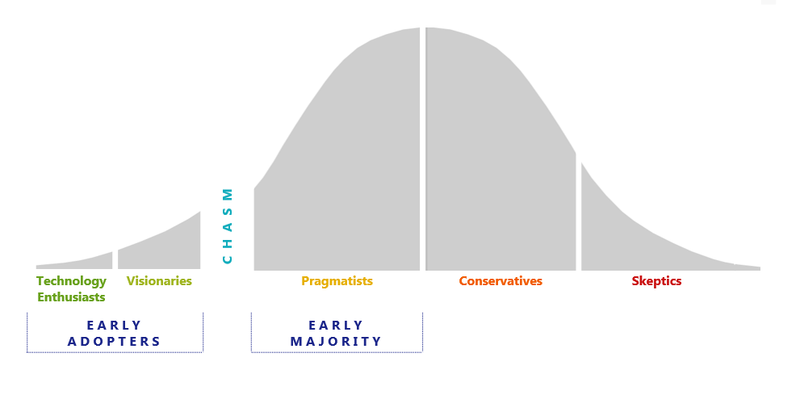 For new technologies to achieve mainstream adoption, they must debunk the widespread perceptions that the early adopter is “young” and highly affluent, and that their product can be used by everyone (think: Facebook). SNL pokes fun at this generational discrepancy. But in all seriousness, if a virtual assistant brand wants to achieve more mainstream adoption among older demographics, the brand gurus and creative teams working on campaigns need to tackle this head on. And they must try to do this—ideally—without alienating the original early adopter group that made them their first million (think: Facebook, again…how many Gen Zers do you know who actually use it actively?). I—prototypical 45-year-old suburban dad—can’t imagine using Snapchat, for instance. If Snapchat wanted to get me and my tribe to buy in as avid users*, it needs to convince me that Snapchat isn’t just for teens and early twenty-somethings. Or it needs to launch a different brand/product targeted specifically at my tribe, and market it appropriately. It’s worth noting there are other social identity constructs that help predict whether a non-user of a virtual assistant is likely to try a product in the future. 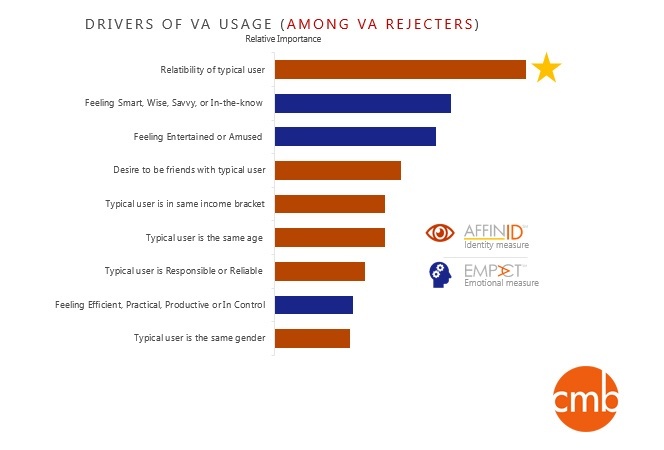 For instance, the few VA category rejecters who perceive the typical (young, affluent) user as being as “responsible/reliable” as themselves are more open to trying a VA in future than those who do not perceive VA users this way. So, we’re seeing this stereotype that virtual assistant products are for young, affluent professionals living in a major coastal city with no kids to contend with yet, and this is turning some consumer segments off from trying out the category in earnest. Stay tuned to this channel for more on our study of the virtual assistant category. I’ll be covering some key insights we got by applying our emotional impact analysis—EMPACT℠to the same issue of what virtual assistant brands should be doing to achieve further adoption and more mainstream usage of their products. *I am more than 95% confident that the Snapchat brand gurus do not want me as an avid user…and my ‘tween daughter would definitely die of embarrassment if I ever joined that particular platform and tried to communicate with her that way. Shortly after midnight last weekend, I was surprised when someone suggested that we head to Boston’s Museum of Fine Arts (MFA). Despite my love of art, while interning at the museum in college, I learned that people like me were not its "typical" daily visitors. Asked to conjure up an image of those who go to the MFA—an imposing neoclassical building located in Boston’s Fenway—I pictured school groups, white-haired docents, and tourists…lots of tourists. I did not envision urban millennials looking for a respite from the Boston bar scene. Not until I saw it for myself. In 2014, the MFA set out to grow their audience and take advantage of a city teeming with recent college graduates. They needed to continue to appeal to their typical daytime patrons (those older tourists, families, and school groups), but with a new director in place, the MFA saw an opportunity to become a sought-after destination for Boston’s millennials. So, the museum launched #mfaNOW—a series of late-night parties, artistic celebrations, and lectures targeted at young Bostonians looking for a fun night out. These events are an incredible success—hundreds of millennials are lining up at the door on weekend nights, sharing on social, and bringing their friends because they now see themselves as MFA museum goers. The MFA is experiencing the social identity effect validated by our research: to change the image of the brand, you need to change the image of the typical brand customer. I experienced it myself that night, as I wandered through a crowd of hip overnight revelers, my perception of the museum and museum-goers began to change. 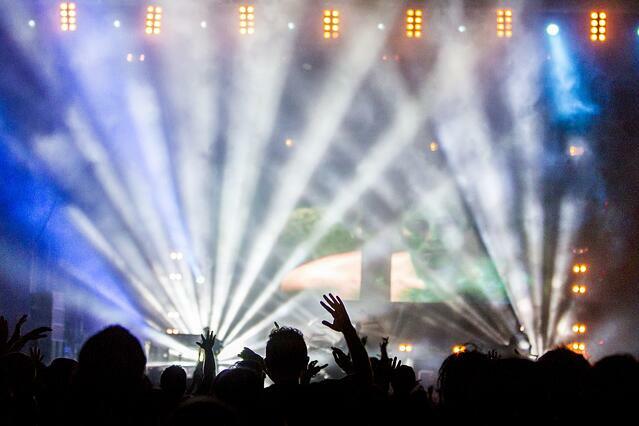 It wasn’t because of the heart-pumping music and flashing lights—though those were cool. It changed because I was immersed in people like me—young city-dwelling professionals—people I could understand, relate to, and who I wanted to be with. It felt like at any point I could run into someone I knew in the crowd, making the night an experience I was excited to share with my friends, either later online, or at the next event! As the results of our research show, who consumers imagine as your brand's "typical" customer really matters. 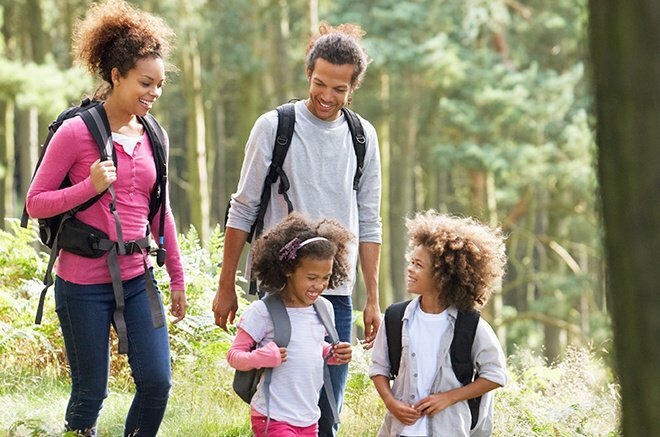 In fact, consumers are 12x more likely to consider brands when they can identify with their image of its typical user. So, brands looking to influence or change their brand perception need to consider who their typical (or target) customer is and create experiences and offer services and products that appeal to that person. The MFA changed the image of its stereotypical visitor when it introduced #mfaNOW. It offers millennials—people like me—the opportunity to see their peers experiencing (and enjoying) the museum in an entirely different context than a typical daytime visit—a paradigm shift for an established brand. Learn more about how we’re helping clients leverage the critical role of identity to create truly customer-centered brands.